Learn everything you need to know about Serta memory foam mattresses in our guide to Serta iComfort mattress reviews. One of the biggest names in mattresses has released a new line for 2016 with a whopping 17 models to choose from. Comprised of both memory foam and hybrid mattresses, Serta aims to cover to a wide range of sleep preferences. This review covers the 8 memory foam mattress models and 20 innerspring models in the 2016 iComfort collection. 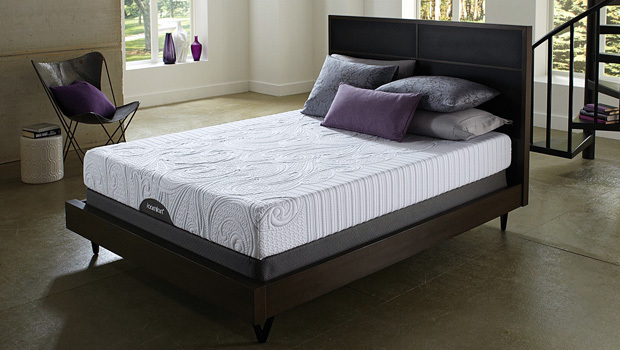 Top competitors to the Serta iComfort Series include Tempurpedic, Sealy Optimum, Amerisleep, and Simmons Comforpedic. Headquartered in Hoffman Estates, Illinois, Serta was founded in 1931 when 13 mattress manufacturers got together and licensed the Serta name. In the 1990s, Serta grew to become one of the industry’s most dominant players. They began selling solely innerspring mattresses and now offer a variety of different types including memory foam and spring/foam hybrids. Serta iComfort 2016 mattresses fall within the mid- to luxury range, with the memory foam models ranging in price from $1274 to $3274. All iComfort memory foam mattresses have a 6” foam base and at least 2” of gel memory foam, with several additional layers to help with comfort, pressure, and cooling. The Hybrid collection features a pocketed coil-in-coil support layer with varying foam and memory foam comfort layers on top, ranging from $1074 to $3274. Memory foams in general receive around 80% customer satisfaction ratings. Serta iComfort mattress reviews from customers rate a bit lower than that (74% according to Sleep Like The Dead), but some mattresses rate better than others. SLTD averages 67% for the hybrid line, versus 63% for innersprings in general. We’ll go over some of the finer points below. Overall, Serta iComfort ranks a little lower than its competitors in part due to the perceived value of the product. iComfort has similar or lower rankings for quality, durability, longevity, and comfort than several brands which are significantly less expensive. Both BedInABox and Amerisleep yield higher reviews than Serta iComfort, despite being costing less for comparable specifications. Serta allows their customers to rate and review their products on their website. We looked at their reviews along with those from other consumer reporting and independent reviewers to see how these mattresses measure up. However, since Serta recently reintroduced these line, some models lack reviews. Take a look at the positives and negatives. With a 74% customer satisfaction rate according to Sleep Like The Dead, most people prove fairly satisfied with their iComfort purchases. But, it might be worth noting that SLTD dropped this score by 2% in 2016 versus 2015. The mattresses rate well in overall comfort. Consumers feel the beds are conformable, offer pressure point relief and lessen back pain. Some reported pain associated with overly firm mattresses, however. While the average satisfaction rates are better for the hybrid lines versus spring averages, the iComfort memory foam appears slightly below average compared to other memory foam lines. The iComfort line offers an impressive array of mattresses to choose from very firm, to very soft and everything in between. As with most memory foam beds, iComfort mattresses rate well in motion isolation. The spring models used pocketed coils, known to have the least motion transfer for coil springs. The added memory foam layers also help dampen movement. This is an important quality for couples who sleep together. And, some models include a supporting edge that prevents people from rolling off. Memory foam mattresses can produce odors or offgas upon opening and for some time after, depending on the mattress. Serta customers report little to no offgassing or odors (about 6% of reviewers versus the average of 10% to 15%). New to the 2016 line is the use of EverFeel™ Triple Effects Gel Memory Foam technology. With a focus on both comfort and cooling, EverFeel™ claims a unique structure tiny cushioning chambers. These tiny titanium gel beads are said to respond to the body’s contours, relieve pressure points, and aid in alignment. EverTemp™ technology increases the range of temperature and humidity where the materials retain their structure and composition. Serta has a 120 day return policy, which is more than average in the industry. Their mattresses are widely available through many retailers, also. Serta also comes in less expensive than some of its luxury competitors, like Tempurpedic and Simmons Comforpedic. So Serta IComfort mattress reviews show plenty of great things, but they also show a few consistent downsides. While cheaper than some brands, Serta’s hefty prices remain one of the most frequently mentioned complaints. The price of a mattress can have much to do with overall satisfaction with the product. An unsatisfactory mattress is less of a burden if it is inexpensive. Customers who rated the mattress very well still docked points from Serta for their prices. A significant number of customer reviews reported their mattresses being smaller than they were lead to believe. This can cause problems when trying matching foundations, frames and other bedroom accessories. Customers also reported receiving mattresses of a different firmness from the one they tried at the retailer. Firmness and comfort go hand in hand, so this can cause some problems. Longevity and durability are also concerns with the iComfort line. 24% of owners report the development of sagging and a decrease in body support occurring within the first three years, says SLTD. Customers reported sagging in the mattresses in the first few months in some instances. The rate of complaints for durability issues is a bit higher than average. A good mattress will not show signs of wear that early in its life (expected to be 8+ years in this price range). Serta uses gel and graphene in some of their foams to reduce heat retention. Customer reviews show negligible improvement with the addition of these substances despite aggressive ad campaigns stating the contrary. Six percent of users report sleeping hot or significant problems with heat retention. Two recent studies have demonstrated that graphene may have adverse effects on human health and the environment. More studies have to be done to determine if this substance presents a significant threat to health, but there is evidence the jagged edges of graphene nanoparticles can pierce cell membranes. Here are the mattresses currently being offered by Serta in the iComfort line arranged by price. We rated each based on their customer reviews, value, durability and other factors. Note that new models may lack reviews, and in this case, an “NA” serves as a placeholder. Serta offers a robust range of products to meet most sleepers’ personal preference in firmness. The least expensive iComfort mattresses contain 2-3” of foam layers, while more expensive models have up to 6” . Although more expensive than many competitors, this price difference does not necessarily translate into value for the additional cost. Serta iComfort consistently scored lower than many lower priced mattresses. Serta is certainly not the most expensive mattress provider on the market, but the quality tends to reflect mid-ranged mattresses instead of the luxury high-end market. When shopping for a mattress, customers need to weigh many factors. Which factors are most important depends on the consumer. Serta mattresses have a lot to offer, but could be too expensive for many shoppers. Their marketing campaigns are costly and customers end up paying for them. There are other mattresses with comparable ratings that cost less. Leave a comment if you have a question or Serta mattress reviews to share! We bought in October 14 an IComfort Directions Reinvention California King. The first thing we noticed is the bed was not as firm as the Queen we tested in the store. Within months the bed was sagging on my side. We had been rotating the mattress every 4 to 6 weeks. If you get off the matress it springs back to what is normal. Basically my wife rolls down hill to my side. After 3.5 years we put a 3″ memory foam topper. That helped some but it still wags and my side is always lower. It is now 3.54 years and we are replacing the mattress. It sags way to way much and has become softer over time. We are now trying a hybrid 500 which is a firmer mattress. We bought Serta I comfort Hybird Applause II Firm King mattress set thru Sam’s Club and had it delivered the end of June. Initially it was fine. I did notice in a few months sagging and since there is no way to turn it over tried to reverse the top to bottom part. I will state for the record, this is a second home and as such the bed is not used daily. I am 115 lbs and my husband is 250 lbs. The indent is on both sides. It has a guarantee of 10 years and it can’t keep its shape less than 6 months. I feel like I am in a hole and it makes it hard to turn over. If you want a product that does not stand up, it is for you. I paid $1700 and have now contacted Sam’s Club to return it and refund my money. Let’s see what happens. If Serta doesn’t stand behind this, I am hopeful that Sam’s Club will. We purchased this mattress and spent four times what we have paid in the past. A year later, there are dips in the mattress, so the firm ness has broken down, however the warranty only covers if you can see the dip. The foam does come back level so you can not see the dip, so the company will not warranty it according to Costner service. Also we would have to pay someone from their company to come out to look and measure it. We will go back to a $500 mattress that we replace every 8-10 yrs instead of $2100 for 1 yr! Serta is a horrible company. They do not stand behind their products when there is a warranty issue. My wife and I paid $2500 for a mattress. It is 2 years old now and already worn out. It has deep indents where we sleep. It is hurting both our lowerbacks. DO NOT BUY ANYTHING FROM SERTA! Worst mattress ever. My back hurts every morning. Was is another city hotel for a week and woke up like new for the first time in 2 years! I purchased a Iserta comfort ultimate Merit mattress a year ago and it is already uneven one side is firm and the other is much softer. I bought a firm mattress and am very disappointed . I complained to the store where I purchased and without even trying it he said nothing is wrong with my mattress . Wait a little longer to complain. Well I think that was unfair as there is supposed to be a ten year warranty on my mattress . It was an expensive matttress and I certainly will not recommend buying one with a warranty that is not honoured. We purchased and Serta I Comfort mattress in October 2015 It also is broke down well over the 3/4 inch allowed it felt like your sleeping on a hammock we payed for an in-house inspection which failed due to a 3 inch sweat stain under the pillow area , so much for the fabulous 25 year warranty , it is totally ridiculous and absurd that someone would have to spend $100 a month to sleep on a mattress and then simply throw it away, I would never recommend or purchase another Serta mattress again . I bought a Icomfort Talent plush memory foam mattress. When I bought it I specifically and distinctly said I did not want a mattress used on the flour because of many allergies and health reasons. Everything seemed fine when the mattress was delivered in a clear plastic sealed bag. I didn’t see a need to check it. Later I noticed it had several soiled spots on it. I contacted the furniture store who refused to do anything. They said they do not accept returns or give refunds. I had waited and shopped around for a long time before I decided on my purchase, a very expensive one at that, and needless to say I very disappointed. What happen to customer satisfaction? Is this dealer satisfaction now? We buy their product in good faith and this is the response we get. Where is the justice? Is there anyone that will hold these dealers accountable? I bought a Icomfort Talent plush memory foam mattress from Island Furniture. When I bought it I specifically and distinctly said I did not want a mattress used on the flour because of many allergies and health reasons. Everything seemed fine when the mattress was delivered in a clear plastic sealed bag. I didn’t see a need to check it. Later I noticed it had several soiled spots on it. I contacted the furniture store who refused to do anything. They said they do not accept returns or give refunds. I purchased a Icomfort Hybrid from Macy’s. Yes, it was the last one and I was aware that I bought it as it. However, I expected it to be “as is” when it was delivered. All the gel was on one side, making the mattress unleveled. When I contacted Macy’s, they referred to the “as is,” policy. I was so disappointed, I haven’t been able to shop at Macy’s since. That was the fastest $475.00, I’ve ever thrown away! We purchased an iComfort mattress in September 2012, and it is already broken down. Much over the 3/4″ allowed. We had a rep look at it as there is a fabulous 25 year warranty. Unfortunately, the Serta Company does not play well with customers. One of the two tags were missing, (not removed by us), and for that reason they will NOT cover the warranty. Funny fact…. that this mattress hasn’t even been in existence for longer than their warranty. Makes me sick to my stomach that we have thrown away $1800 for a bed that we had just a little over 3 years. In my research, they also do not abide by their warranty if there is a stain, no matter the size. Truth be told, they will do anything to not cover your mattress under their “fabulous” 25 year warrant. Beware, and shop around unless you don’t mind paying $40 per month to sleep on a mattress.